Saving the world for dogs. 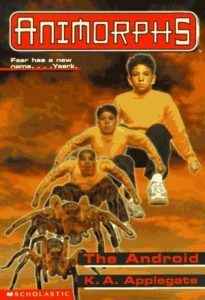 The Android was always one of my favorite Animorphs books when I was a kid because, even before I knew what it was, I loved worldbuilding in fiction. This is one of the reasons I love serialized storytelling so much, because serialized stories (no matter the medium) are the ones that have the most room to deepen and define their fictionalized worlds without sacrificing character or theme. And The Android does quite a bit of worldbuilding in a short period of time. But I’m burying the lede, here. It’s Marco’s old friend Erek and his “family” who are the real focus. Because Erek turns out not to be human, and he might even be involved with The Sharing somehow. The Animorphs end up doing recon at a Sharing retreat, but end up exposing themselves when Marco gets eaten by a crow, and he has to demorph in front of Erek. But Erek doesn’t immediately betray them to the Yeerks. Instead, he tells them to meet at his house in a few days, that they are allies in the fight against the Yeerks, and promises to explain everything. And man, is it ever a weird explanation. Erek is an android, a robotic artificially intelligent being. He and his “family” are called The Chee, which was a name given to them by their creators, the Pemalites, an extinct race of pacifist aliens who died out 50,000 years before. They pass as humans using advanced holographic technology, and they have been doing so since humans developed civilization. They, too, are pacifist by design. The Pemalites programmed them so they could never hurt another living creature. Only, some of them, like Erek, are frustrated by their limitations, and want to be able to join the fight against the Yeerks. They enlist the help of the Animorphs to steal a Pemalite crystal in Yeerk control, not only to keep it out of Yeerk hands, but to use it to re-write their programming. It sounds pretty straightforward, but the way Applegate handles it is an example of why I love this series so much. Erek and his friends see the war with the Yeerks happening, but feel like their programming prevents them from getting involved in the fighting. But there are some Chee who do not wish to overturn their programming, who believe that nonviolence is the best option. 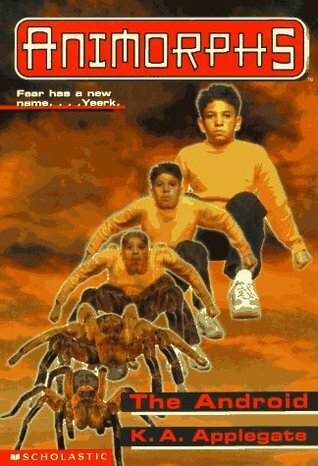 The Animorphs unsurprisingly take Erek’s side. Nonviolence is nice and all, but from their perspective, they can’t afford philosophical stances when real lives are at stake. Marco’s dad is in danger of being made a Controller for his work. Jake’s brother already is one. Marco’s mom is Visser One, and his whole life was torn apart because of it. Things will only get worse if the Yeerks aren’t stopped, and stopping them is not something that can be accomplished with nonviolence. Basically, the book acknowledges that the ethics of nonviolence, especially in a time of war, are not black and white. They’re grey as hell. This is made especially clear when Erek does rewrite his programming in the midst of battle in order to save the Animorphs from certain death, but in doing so, he kills twenty Hork-Bajir and human Controllers (both the Yeerks and their innocent hosts), and he does so in an unbelievably brutal fashion. And because he’s an android, the memory of doing so will never leave him, never fade. Saving the Animorphs, who are pivotal figures in the conflict to come, whose survival may mean the difference between a Yeerk victory and defeat, was the right call, but it also meant killing innocent beings, which is something that can’t be celebrated and shouldn’t be forgotten. There’s also some little stuff in here, both funny and serious that deserves a mention. The Pemalites, and the alien race that destroyed them, the Howlers, are not just one-off aliens. They will both come back, and we will learn much more about them. We don’t get much regarding the Howlers here, but any race that destroys what are essentially intelligent dogs is big trouble. Speaking of dogs, the only thing left of the Pemalites, it’s sad and so weird that the Chee want to save Earth not for humans, but for dogs. I haven’t mentioned much about Marco in this review, but he was a nice way in to this story. His investment in the fight has steadily deepened, and his protectiveness and anger over his family is starting to affect the way he goes into missions. Aside from Ax, he’s also lost the most to the Yeerks, even if Jake is the only one (and now Erek) who knows about it. He also got a new haircut in this one, which he agonizes over at length throughout the book, but it turns out that the reason he got the haircut is that Scholastic had a new cute model they wanted to use for Marco, but he had short hair. So Applegate gave him a haircut. Behind the scenes! Share the post "Saving the world for dogs."